Full-size high chairs tend to be bulky, which is great for stability and comfort, but cumbersome for on-the-go parents. A portable high chair that is safe, easy-to-attach, and lightweight makes feeding baby a breeze when you’re away from home. The easy-to-use-and-attach Inglesina Fast Table Chair came in as our top pick among a crowded portable high chair market. At $70, the hook-on style Fast Table Chair is lightweight (just 4.2 lbs! ), but it also folds flat, attaches easily to most tables, and offers a safe and comfy seat for babies through the toddler years—giving parents more bang for their buck. Toss it over a shoulder in the attached drawstring storage bag for an easy and convenient on-the-go option, whether you’re hauling it to a baby-sitter’s, grandma’s house, or a restaurant. We sorted through more than two dozen portable high chair and booster options, in a variety of styles: hook-on, seat harness, booster style, folded seats—you get the idea. Consumers have a lot of choices when it comes to portable seats, from well-known and lesser-known manufacturers. From the get-go, we were hesitant to include bulkier booster-style seats among the portable options, because they are heavier and not as easy to stow and tote. But, because they are fairly universal and wildly popular among consumers, we gave a few a shot. We also tried to keep in mind that not all parents are using portable seats for their portability. Some moms and dads just want a smaller, everyday high chair that won’t take up as much room as a full-size seat. The Inglesina Fast Table Chair ranked well in every area. Other portable options were tricky and cumbersome to use—or not compatible with certain chair or table styles. Some also were tough to clean and didn’t offer an equally comfy and safe seat for a baby and toddler. The Fast Table Chair doesn’t disappoint. On-the-go parents who want a safe and clean dining seat for their baby when they are away from home. Ideally, the seat will work with a variety of table or chair styles and will accommodate junior from about age 6 months through the toddler years and beyond. Parents with less space to spare in their kitchen or dining room may also want a portable high chair to use as baby’s everyday dining seat. What Makes A Good Portable High Chair? Unlike a full-size high chair, portable seats are compact, making them easy to store, carry, or use. They are also less expensive. A full-size high chair includes a sturdy base, a high seat, a tray to stow food, and extra safety precautions, a portable high chair might not have any of these features, depending on the style. If a full-size high chair will better suit your needs, you can find our full review here. A great portable high chair will share some common traits with bigger full-size models though. Safety, durability, and cleanability are universally important. If you’re wrapping up dinner at a restaurant, parents won’t want to spend 15 minutes scrubbing off bits of leftover food from their baby’s seat. They want to pay, go, and take the seat easily with them to clean at home or wipe down quickly. A great portable seat is made of durable, easy-to-clean fabrics or plastics, without too many crevices to catch fallen foods. Parents will also want a safe seat. High-chair-related injuries have increased 22 percent between 2003 and 2010, according to a study published in 2013 by the journal Clinical Pediatrics. Children aren’t always properly restrained and fall. Good portable high chairs feature a safety harness and and a post or bar (called a “crotch post”) that goes between the baby’s legs so he doesn’t slide through. If the seat is a stand-alone booster-style, it should have a wide bottom to prevent tipping when not attached to a dining chair. As for aesthetic, parents have their pick of several styles of portable seats at many price points, from $20 to $90 for costlier brands. The booster style is the most popular and bulkiest of the compact options. Portable booster chairs resemble full-size seats, but don’t have legs. Instead, these chairs attach directly to a dining room chair with straps behind the chair back and bottom. Without a tray, this style allows the baby to sit right at the table with her family. Some portable booster-style chairs don’t come with trays and can be used as booster seats well into the preschool years. A portable seat harness, sometimes called a wrap-style, doesn’t come with a tray either and technically isn’t even a seat. Parents fit a fabric harness over the back of any standard chair and secure baby in place with straps or buckles connected to the harness. The baby sits on the chair, but is held in place. Wrap-style seats are cheap and super compact, with some folding up to roughly the size of rolled up T-shirt. They also come in a variety of machine-washable fabrics. Some seat harnesses have a foam-seat cushion, which adds some bulk. They attach to a chair the same way, but give baby a little more padding on their back and tush. Hook-on style portable seats attach directly to a table’s edge with either clamp-on or screw-on arms. The baby sits in the seat at the table or counter, but doesn’t occupy a dining chair or take up any floor space. Other portable high chair styles include seats that fold, inflate, or bag-up like a bagged folding chair. Portable high chairs don’t cost as much as their full-size big brothers, but prices do vary. Harness-style seats run about $25 while name brand hook-on style chair cost as much as $100. 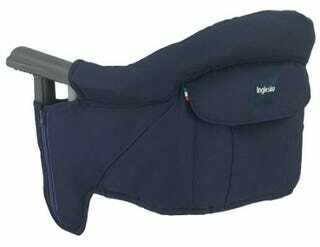 Booster seats and those that fold or inflate make up most of the mid $40-$60 range. We tested seats from each style category and price range, but found that $75 is more than an enough to buy a solid and safe portable high chair. With so many portable options on the market, we set a basic criteria that each contender had to meet for storability, portability, and universal use with various tables and chairs. From there, we upped the ante to narrow down a top pick, looking for chairs that are also lightweight and comfortable, clean easily, accommodate infants as well as preschoolers, give the option of a tray, and are made with environmentally safe parts. We also were on the lookout for a cool factor, or a little something extra, that would push the purchase of a portable high chair from the “maybe buy” list to the “must have” list. We plowed through pages of user comments on Amazon and other retail sites, watched several YouTube reviews, read baby gear or mommy blogs, and double-checked recall lists to narrow down the lengthy list of portable chair options to a few standouts in each category— harness, booster, and hook-on. Then, we nixed the seats that didn’t quite measure up or were described as awkward or unsafe in multiple reviews. After comparing prices, chair popularity, and extra features, we settled on 10 front-runners to road test. For more than six months, these chairs went where baby did: weddings, Grandma’s house, restaurants and church suppers. With portability and ease of use in mind, our goal was to try out all of the seats in as many scenarios as possible with a wide variety of tables and dining chairs to test compatibility. We also got them messy, took the trays on and off, cleaned them, stowed them, pushed on seat bottoms to check for wobbles or comfort, and tried them out on babies of different ages and sizes. One pick kept emerging as the best. The easy-to-use Inglesina Fast Table Chair is a category workhorse and our favorite. This hook-on style seat is sturdy and attaches easily (in less than a minute) to almost every table or counter, without damaging or scratching surfaces. Plus, it stores in a snap in an attached, sewn-on bag that folds into a pocket on the seat bottom. At 4.2 pounds and just a 4-inches tall when stowed, you can even pack it in a suitcase. The seat is comfortable and padded on the sides and back in a wipeable fabric that is durable, but not too scratchy. Initially, a hook-on style chair seemed intimidating and, frankly, unnerving. We wondered if it might slip off or cause a table to tip. A large booster with straps to tether to a chair seemed intuitively more safe. But those big boosters can be clunky and not very portable—a top criteria for this review. So, we gave hook-on chairs a shot, as well as harness-style and other foldable models, plus boosters, too. The Inglesina Fast Table Chair emerged as the go-to seat time and time again. At $75, it’s a bit pricey compared to others, but not a bad deal for a quality, well-built chair that will last a few years. A few harness and booster-style seats performed well during our tests, held up to sticky messes, and traveled okay. (For moms and dads who are certain they want a specific style other than a hook-on, we’ll give you some alternatives below.) We also tried two other hook-on chairs, but neither attached as easily or as securely as the sturdy Inglesina. But first, some details on our top pick. The Inglesina Fast Table Chair will grow with your baby from about 6 months up to 37 lbs., or about 3 years old. It’s made of a tubular painted steel frame, but covered in a wipeable fabric that is removable when you need to scrub tough messes. The fabric is available in nine color options. The materials are all BPA-, PVC-, and phthalate-free. This seat has two arms with grippers on the underside so they don’t slip. Underneath the arms (and below the table when attached) are two twist-tight couplers and more non-slip gripping. This gives parents complete control to adjust or twist the couplers so they hook securely to a table and accommodate various thicknesses. The Fast Table Chair features a three-point safety harness in a durable material to buckle baby into the seat. The center buckle is attached to a 2-inch-wide crotch strap that goes between the baby’s legs so he can’t slip through. A Velcro fabric cover flips over the buckle to make sure it stays locked, but also to keep it clear of food particles that might compromise the latch. This seat also features a soft cushion and padding around the frame for extra comfort, an added bonus for parents who plan to use this space-saving seat as a primary seat at home. It has a pocket on the back to store utensils or bibs, plus another hidden pocket on bottom to stow the sewn-in storage bag. This chair is collapsible and the arms fold in so the entire unit slides into the attached drawstring bag and can be slung over your shoulder or tossed in a car trunk. Each arm also has a push pin under the fabric. When pushed, the arms rotate and detach. Slip off the seat pad and toss it in the sink to soak. Inglesina sells this chair without a tray because the baby, while in it, is already positioned with his tummy close to the table. To contain messes, consider adding the Fast Dining Tray for just $10 more. The 14-inch-wide tray snaps onto the arms and has deep borders that will contain about half a cup of liquid after a spill. Inglesina says that the Fast Dining Tray is compatible with every version of the Fast Table Chair since 2007, but some Amazon reviewers say it doesn’t lock and lay flat on some older chairs. The white tray washes well and can slip inside the storage bag with the chair when it isn’t attached. The one misfire about the Fast Table Chair is the 2-inch gap it creates between baby’s tummy and the table. The tray doesn’t close up the gap at all, even with older babies and bigger tummies. We suggest babies wear a pocket-style bib to catch fallen pieces of food and save you time sweeping the floor. Another thing to keep in mind: when the chair arms and twistable couplers are completely open and at their widest, there is only about 3.75” of space, meaning this chair will not safely attach to a dining room table that has a 3.5” or longer skirt on the edge. Of all the tables we tried, only one had an extra wide skirt, but we were able to push the chair in place anyway. Unless your table at home has an extra wide lip, the universality of this chair compared to other portable seats still makes it a great buy. We attached it to picnic tables, folding tables, kitchen counters, a cafeteria table, a pedestal table with a wide base, round tables, and more. Other chairs can’t match the universal use. The only table we didn’t try and wouldn’t recommend is a glass-top one. Diapers.com calls the Fast Table Chair the industry’s best travel hook-on seat, describing it as, “a practical option that’s perfect for eating out or eating in. Plus, it’s just so smart—it has a fold-flat closing system, storage pockets and even a travel bag hidden inside the seat.” A Baby Gizmo review liked those features too, but also it’s ability to bring baby right to the dinner table with her family. If you are wanting something different than a hook-on chair, perhaps spend $10-15 dollars more to try the Mamas & Papas Baby Bud Booster Seat and Activity Tray for $85. This booster-style chair is available without the activity tray, too. The Baby Bud has a soft, wipeable cushion and easy-to-use tray that locks in place, making it a great seat for long-time use or for parents who want a spacer-saving booster as an alternative to a full-size high chair. This chair has a molded handle in back for on-the-go needs. Best of all, the tray fits snug to baby’s belly—no gap or food mess on baby’s pants. The bright toys that come with the activity tray are a splurge, but could appease a hungry baby while dinner is being prepared. The Chicco Pocket Snack Booster is such a great little chair, it won’t feel like a step down. And, at $30, it’s a good deal. The Pocket Booster is a booster-style seat, but is still very portable. To stow it: snap the adjustable metal legs into place, remove the tray, push on the release buttons on the seat arms, and pull the seat back toward you until the seat folds in half. Then snap the tray back on so the whole thing is compact in one piece. Using this seat isn’t as intuitive as others, but once you get the hang of all the snapping and pushing, you’ll appreciate the portability. This chair is all plastic, which makes clean-up a breeze but could reduce comfort. It’s also a great seat to grow with your child, accommodating kids up to 50 pounds. The metal legs on the seat have three adjustable height levels so baby can always sit at the table. But the lever to adjust the legs is tricky. For a completely different style that is still in the $30 range, try the Totseat Chair Harness. This little fabric harness can fit on virtually any style of chair with a round, square, or open back. Best of all, it rolls up to easily fit in a diaper bag. The entire thing is machine washable for easy cleaning. We don’t recommend using this harness with babies who are young or new to sitting. The 6-month-old we tested it on kept sliding. Keep in mind that because the baby sits directly on the chair, he’ll be too low to use the table and there is no way to attach a tray. We considered these alternatives from manufacturers, but don’t recommend them. Fisher-Price Spacesaver High Chair ($50) — Many parents love this popular Fisher-Price chair as an alternative to big full-size high chairs. We tested the Spacesaver, but found that it’s really too bulky to be a true portable seat. It’s also prone to tipping when not strapped to a chair and can be a hassle to clean. It does have a five-point safety harness and was the best portable chair we found to accommodate an infant younger than 6 months old. Fisher-Price Healthy Care Booster ($27) — This no-frills Fisher-Price chair offers a safe booster for baby with a dishwasher safe tray. It’s all plastic and cleans up easily. It’s billed as a portable chair because the seat back folds down and the harness becomes a shoulder strap. But, compared to other seats we tried, this chair is still too bulky to be a strong portable contender. Summer SecureSeat Chair & Hook-on Booster ($55) — This seat attaches to tables with wide edges — up to 5”. But, it’s so difficult to attach and remove that it’s a hassle. Summer Infant Sit ‘n Style Compact Folding Booster Seat ($48) — We wanted to love this unique chair. When you push in the release buttons on the side, the whole thing flips around to store. Then, you push a different lever to release. It’s like a magic trick. Even once we figured out the trick and the special way to attach the tray, it was never easy or intuitive. Svan Lyft Booster Seat ($80) — This sleek, modern booster looks different than the rest, using telescopic legs for height adjustment and wood pieces. But, reviewers complain that the buckles break easily and the straps are flimsy. Overall, the booster doesn’t reflect Svan’s usual high-quality work. Cleaning the Inglesina Fast Table Chair isn’t the easiest. The removable fabric cushion offers comfort, but also extra weaving to trap grime. We tried wiping it with a damp cloth, scrubbing on stains with a sponge, and picking out crumbs from the crevices. But dried-on food particles or stains remained. Finally, we threw the entire seat in the sink and sprayed it down with cold water using the high-pressure sprayer. That did the trick. Let the chair dry completely in the sun or in a dry bathtub. We wiped down the chair after daily use, but used the sprayer every few weeks or after heavy use. If you use the tray, hand wash it only. Inglesina guarantees its new products (still owned by the original consumer) to be free from defects in materials and or defects caused by workmanship for two years from the purchase date, plus a third year for customers who register their product online. The warranty doesn’t cover normal wear and tear or unreasonable damage. You won’t believe how quickly the Inglesina Fast Table Chair can be set up, either at home or when you’re out for dinner. . Skip the wasted time and mess of balancing the baby on your knee to feed them from your plate or the filthy restaurant high chairs.